This is the most popular tatami placement pattern. We have packaged them together at a special price. If you need help with Tatami selection please contact us to discuss your requirements, we're always happy to help. Soft woven rush (igusa) straw skin & compacted rice straw core. Edging (heri) of brocade cloth. Tatami were originally a luxury item for the Japanese nobility. Tatami mats are a kind of rush flooring used in traditional Japanese homes. Made of woven rush grass around a rice straw core, they are gentle but firm underfoot and also give off a lovely scent, especially on rainy or humid days. Traditionally, futon mattresses are placed on Tatami, providing additional cushioning plus breathability. Manufactured in Taiwan with Japanese and Taiwanese materials, our mats are constructed in much the same way Tatami mats have been traditionally made in the east for hundreds of years. Our mats use all natural Rush grass exterior and rice straw foundation, instead of the wafer board or particle board that is commonly found in less expensive mats. Layered Rice straw is more time consuming to manufacture but it gives our Tatami mats that firm feeling with a slight and comfortable give that make Tatami mats such a unique and valuable floor covering. In addition, the Rush grass straw used as a covering for our Tatami mats is rated "Best Grade #1", meaning little or no visible variation in grass straw pattern, further evidence of the quality of construction used in the Zentai Living Tatami mats. This entire package is then wrapped in a durable cloth edging and tightly woven and tension stitched to prevent warping or bending. Our Tatami Mats are designed to withstand years and years of heavy use. Great for entrance areas, dining rooms, meditation rooms, bedrooms or martial arts studios. We have been sourcing our Tatami mats from the same factory since 1984. We import these directly and ensure that our mats are not fumigated at port. Instead, all our tatami are heat treated to comply with Australia quarantine regulations. 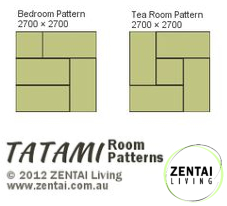 Constructed of 100% non-toxic materials, our Zentai Living Tatami are quite simply the best tatami mats available in the Australian market today.